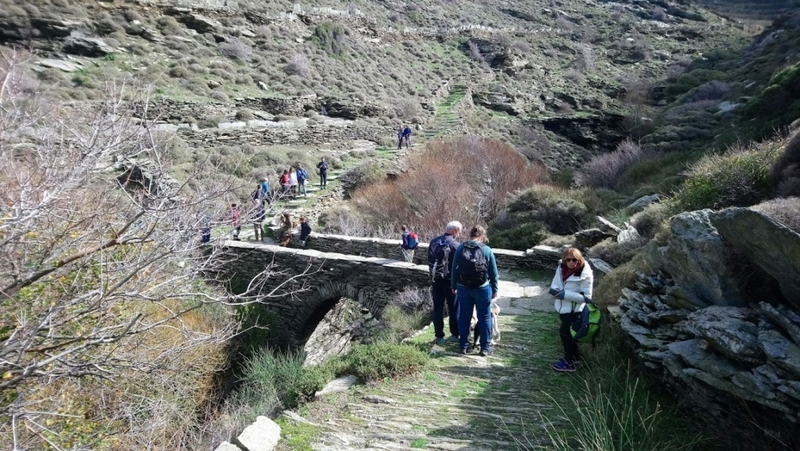 In the 3rd maintenance hike of 2019…Dipotamata-Kochylou-Ormos Korthiou! 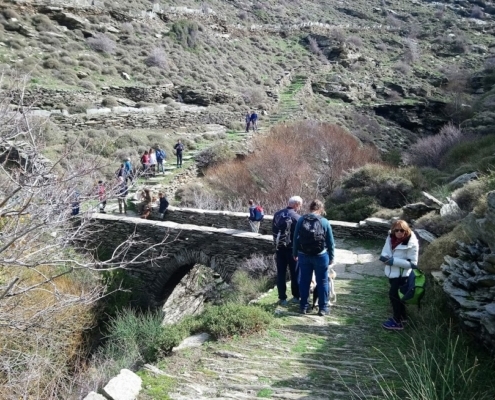 Another pleasant hike took place on Saturday 3rd February. 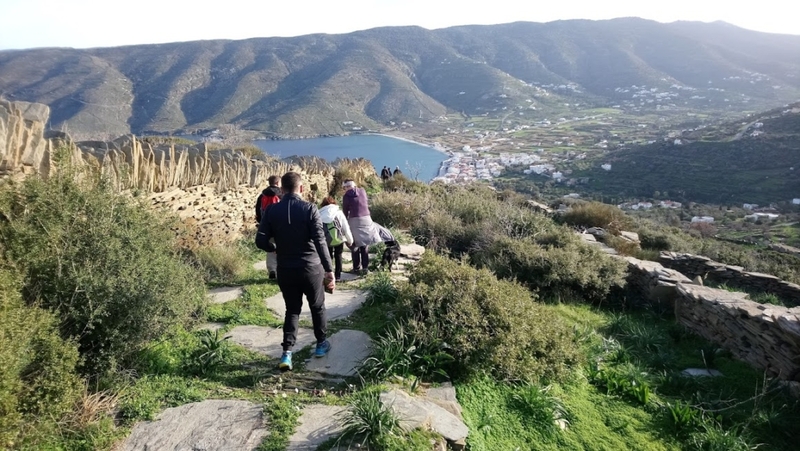 The hike was organised by ANDROS ROUTES as part of the programme of maintenance hikes that aims to bring as many people as possible into contact with the island’s paths to experience the beautiful landscape they give access to while undertaking the essential maintenance work to keep them open. 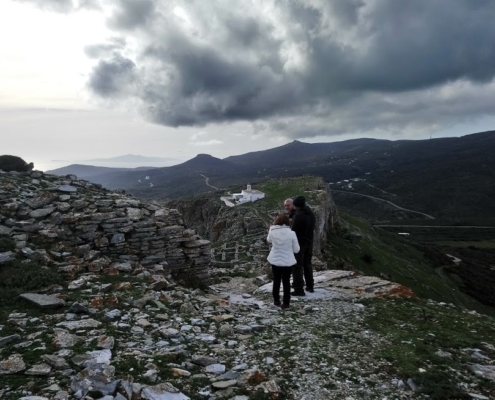 We started with 17 people from all parts of Andros and from Athens, who met in Korthi. After we boarded the bus, we headed for the Dipotamata valley, where we were joined by four others who were waiting at the start of the hike. After some brief introductions, we started on what was a journey full of beauty that the perfect weather made it even better. 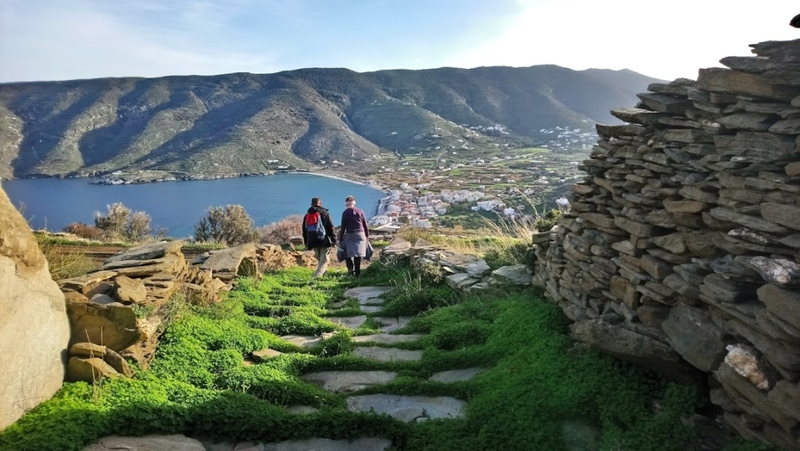 The green landscape, due to the recent rainfall immediately put everyone in a great mood, tempered only by the realisation that the sprouting greenery meant work ahead where the fast growth had started to block the path. As we walked, we worked on cutting back new growth and cleared away fallen stones. 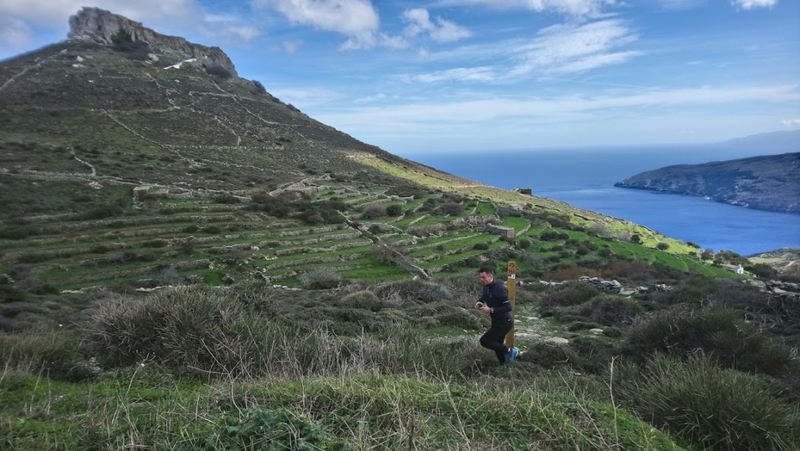 As we approached Kochylou, the team divided into two, a group that took a detour up to the Upper Castle (Pano Kastro) and another that continued to Ormos Korthi. 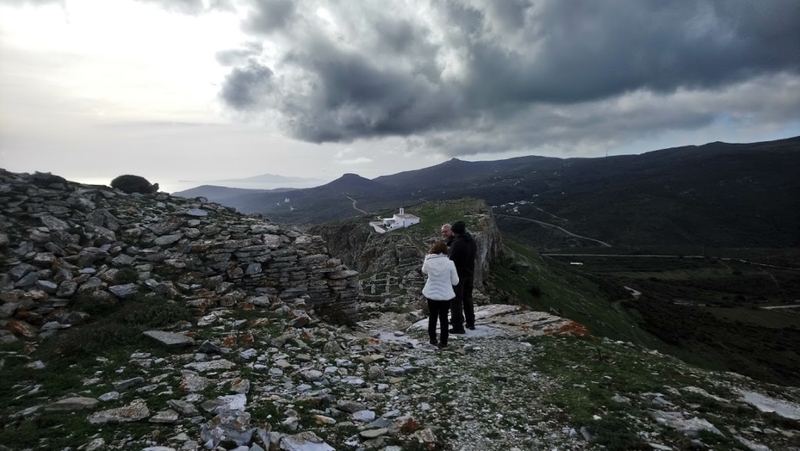 Twenty minutes later we were at Kastro and a magnificent view of the Cycladic blue, with more than a thousand shades of colour. 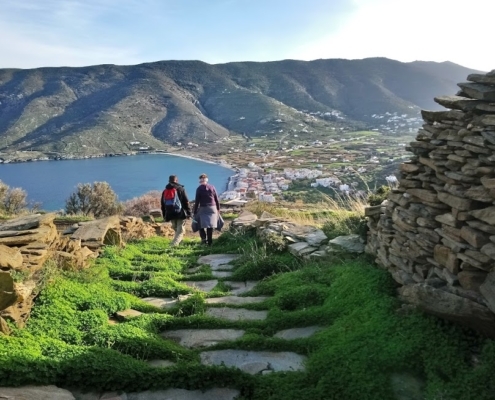 As always when we visit, we all agreed “The climb was worth the effort!” Any initial doubts about the ascent disappeared right away and, for a few minutes, we silently enjoyed the spectacular view spread out before us. 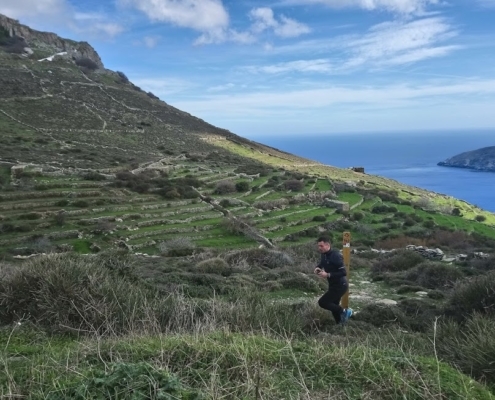 After a break for a snack and many photos full of cheerful faces, we started downhill with the view of the Korthi bay in front of us. 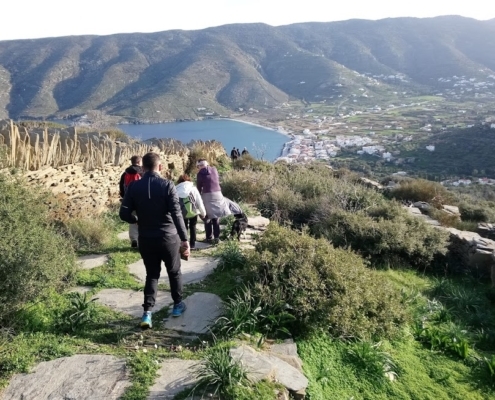 At the end of the day, we found ourselves in a well-known restaurant in Korthi where we cut a specially decorated hikers’ New Year’s cake kindly offered to us by the Fournaraki bakery of Korthi.